We make use of a Heska Dri-Chem 4000 blood analysis machine in our practice in order to test basic blood parameters. Blood parameters help us in diagnosing various diseases, as well as in monitoring our patient’s recovery and response to treatment. With the help of this machine we can measure kidney function, assess liver damage, monitor blood proteins and various electrolytes, etc. Because we have this machine in-house, we can draw blood from your pet, test it and give you feedback within half an hour. This enables us to make quick decisions with regards to treatment options especially in emergency cases. In the rare case of having to send blood away for further specialised tests, we simply send the blood away to a nearby human laboratory that does veterinary profiles, too. These results will, however, only reach us within 24-48 hours. With this in house lab facility we can also do a pre-anaesthetic blood test before any procedure is done that requires anaethetic. In this way we can be sure that your animals vital organs ( liver and kidneys) will be able to handle the anaesthetic. This is often one of the first steps in working up a more complicated medical case. 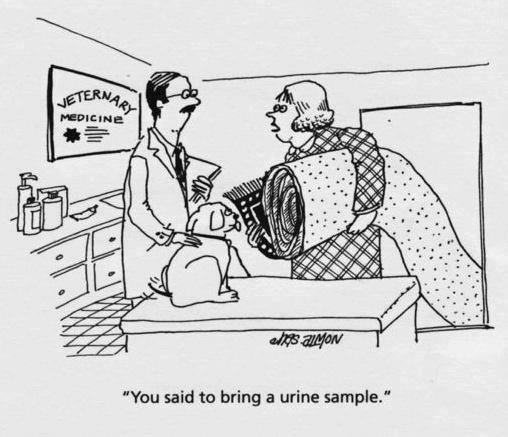 By testing the urine we can often get a lot of very useful information about our patients. It may even be the only test needed to diagnose several different conditions such as kidney failure, bladder infection or Diabetes mellitus. We have snap tests on site to diagnose viral infections for viral diseases such as Feline Leukemia Virus and Feline Immunodeficiency Virus in cats,or Parvo Virus in dogs. These snap tests look very similar to a human pregnancy test and can give us an answer within 10 minutes. If we need to test for other viruses for which we do not have snap tests (such as Distemper Virus in dogs or Corona Virus in cats or dogs) then we can always send a sample away to the laboratory and get an answer within 24-48 hours. This test is done to confirm that your pet (cat or dog) has been properly vaccinated against Rabies and has adequate immunity against the disease by actually measuring the level of antibodies in the blood against the Rabies Virus. This test is often a requirement for dogs travelling from South Africa to European countries and the UK. It is always advisable to begin making arrangements several months in advance before your expected travels with your pets. This is advisable, as it may take up to 4 months to get all the necessary documentation ready as well as to comply with all the state veterinary departments rules and regulations. Annual Rabies vaccinations will have to be up to date before the test can be performed. The test involves drawing some blood and sending it to the Onderstepoort Veterinary Institute (which is the southern African reference laboratory for Rabies) for analysis.